For musical relaxation guitar is a superb choice. People who have been playing for a long time know that strumming the guitar strings making beautiful music is both cathartic and relaxing. There's something about guitar music that helps players come to a total state of relaxation. No matter where you choose to play, the guitar can take you miles away from where you are and let go of all of your stress. You get lost in the music and start picturing a place much calmer and stress free than where you are right now. [[Relaxation Imagery Exercises| Relaxation imagery exercises]] are a common technique many stressed people use to calm their thoughts and physiological responses to stress. When you are stuck in a place that continuously causes you to feel stress, taking your mind and putting it somewhere else can trick you into believing that you no longer need to be stressed because the threat is no longer present. Playing guitar is an excellent way to promote imagery relaxation because when you hear the music, it eases your mind so that you are able to think of more relaxing places. What you believe as a peaceful sound may be different from what others believe is relaxing. The relaxation that you experience playing guitar is not necessarily from the actual sound but your enjoyment of the sound, which means that people can find enjoyment in any type of instrument they love to hear and play. The type of guitar music that will help you relax depends on what you are in the mood to play and hear. If you are mad, you may find playing a hard, fast song to be relaxing since you are able to release tension through rapid play. If you are just overwhelmed and feel discouraged by life, something slow and rhythmic may be more beneficial in promoting relaxation. Guitar playing is wonderful because there are so many different types of songs you can play. To find music to play on your guitar to match your mood, including tips to get started as a guitar player, check out LoveToKnow Guitar. 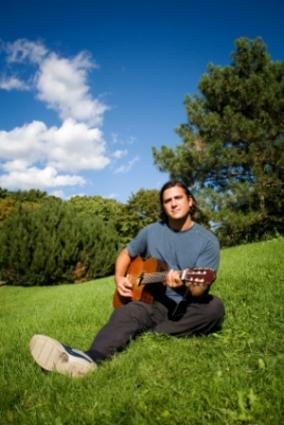 The benefits of relaxation guitar music have a lot to do with how well you can play. If you are a beginner, you may not find the enjoyment of playing as much as someone who is more advanced. You may become frustrated with not being able to play the right strings, which causes you much more stress than you had before you began playing. Fortunately, this is only a temporary state of anxiety. Once you have mastered playing guitar, you will soon feel the relaxation benefits of it. If you plan to teach yourself, get some instructional DVDs and practice every day. If you prefer to hire an instructor, make sure you get along with him or her so you don't have to spend a lot of time with someone you can't work with, which could just add to your frustration and stress. After a few sessions, you will probably know a few songs that you can play pretty well and the more you play the more songs you will master. Soon you won't have to pay so much attention at what you are doing with the guitar and pay more attention to the beautiful music you are creating. The great thing about playing guitar for relaxation is that you can take it virtually anywhere. You can take it to a nice park or just play it in one of your favorite rooms. On your journey to total relaxation, guitar playing will help you get there in no time!